It was a cool spring day in Baltimore, and the theme was FOOD. On the southwest corner of Baltimore’s Inner Harbor, 24 teams were finalizing their entries for the judges and the starting line, and 1 team was still rigging their trailer hitch, hoping not to miss the start. (They did.) A glorious day! For hours, clouds threatened rain—but only for an hour at mid-day did they dump their drops, accompanied by heavy winds that made the water entry a lot more interesting. 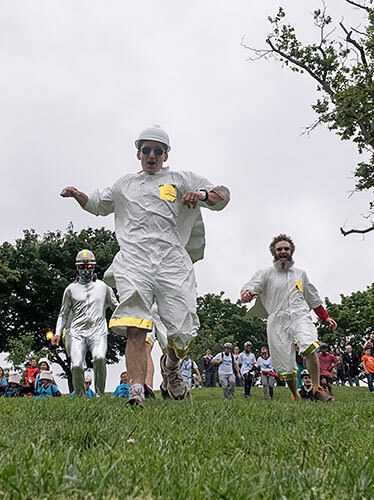 Our team of 6 kinetic photographers followed the race from start to finish, taking 5,816 photos. The best 268 are in this report. Click the “Next Page >” button to go to the next team, or select any of the list of teams at the bottom of the page. To see others’ coverage of the race, or to tell others about your race experiences, be sure to check out the Kinetic Forum. 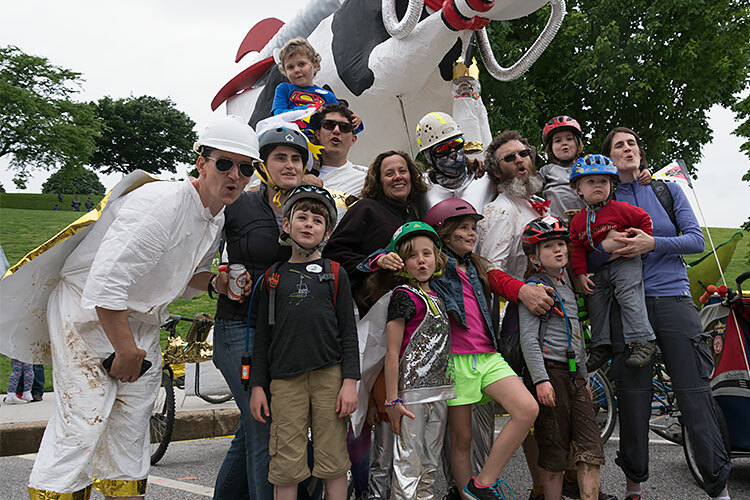 Having won the 2016 Engineering award with their first-ever entry, Birdie: The Sculpture Vulture, St. Casimir’s Catholic School in Canton returned to win the 2017 Grand Mediocre Championship with Cowsmic Moobeams, portraying ungulate space travel in the form of an amphibious human-powered racing sculpture. 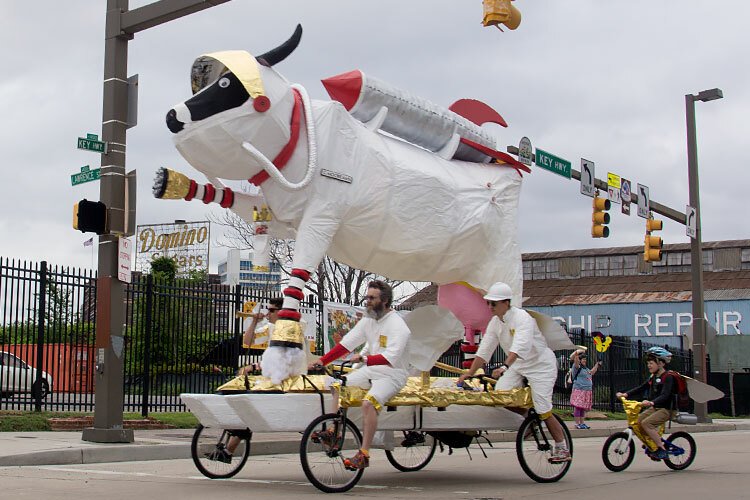 The cow started the race wearing a spacesuit. It was speedy and smooth on pavement, here rounding Key Highway in South Baltimore. 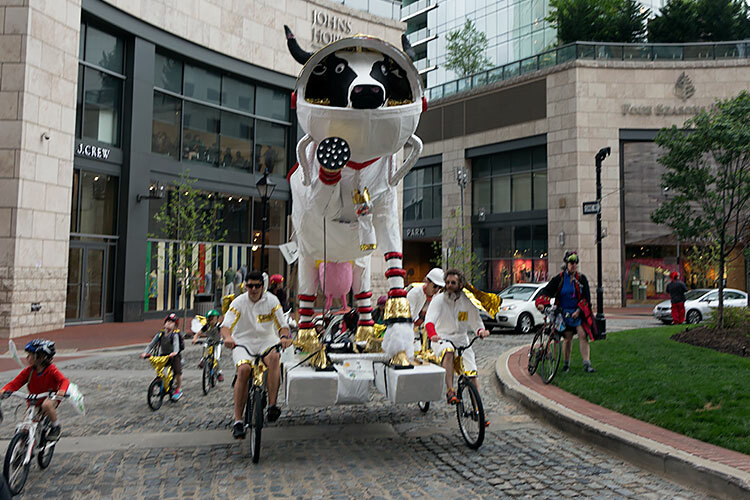 The cobblestones around the National Katyn Memorial were no challenge to the space cow. If you’re building a sculpture, note the emotional appeal of putting a face on the front of it. 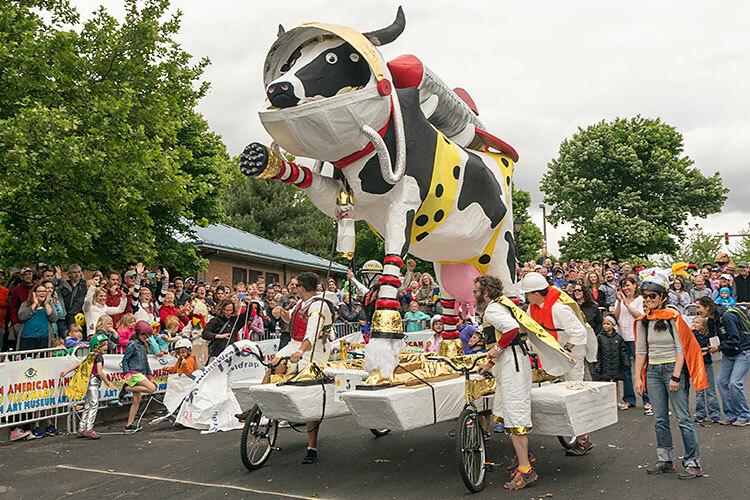 By tradition, Kinetic Sculpture Races begin with a Le Mans style start. 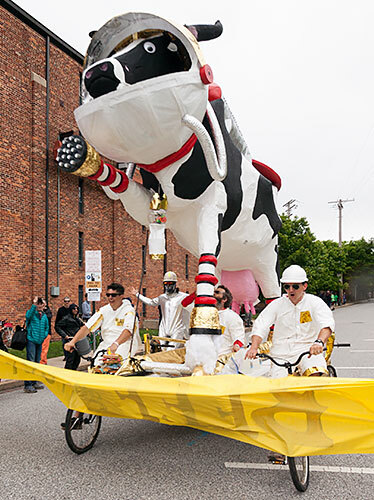 Sculptures are parked adjacent to the American Visionary Art Museum, and pilots and pit crew climb Federal Hill. When Sister O’Blivion strikes the launch gong, the costumed racers run down the steep grassy slope to their crafts, and drive off. The afternoon finish line is also next to AVAM, and racers break the tape with completing months of hard work. The sign at St. Casimir’s school proudly announced the race. 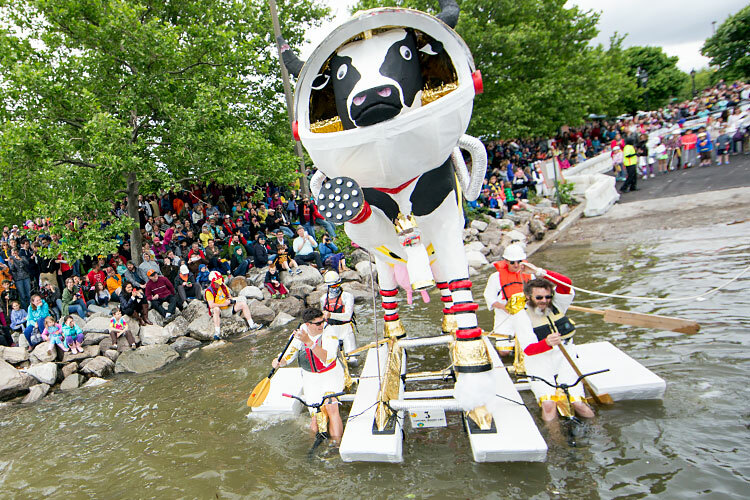 As she prepared for the water entry, Cowsmic Moobeams dramatically shed her spacesuit to reveal a yellow polka-dot bikini. 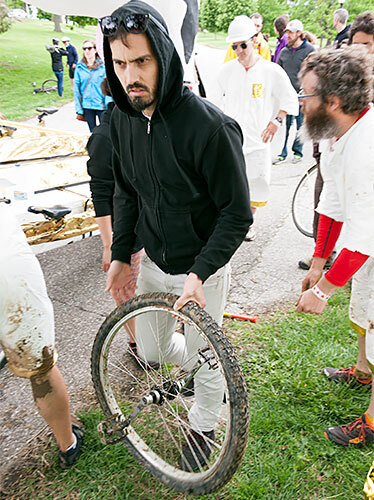 The four-unicycle independent suspension inspired by Mars Curiosity Rover allowed for amazing transit through the mud challenge in Patterson Park. 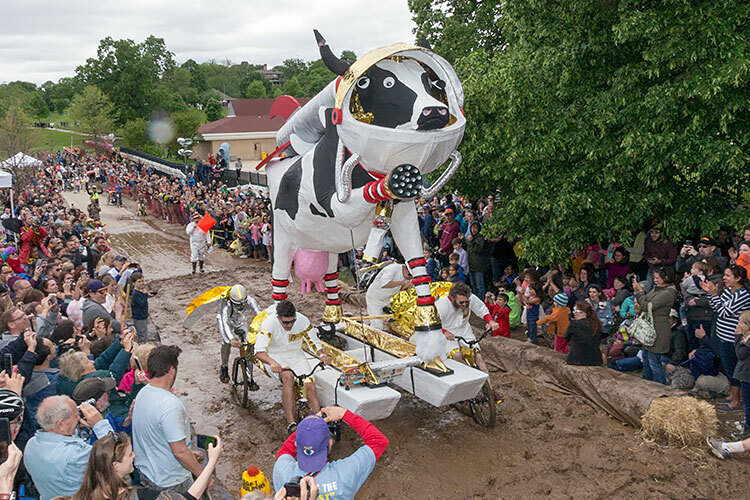 It’s almost impossible for a sculpture on standard mountain bike tires to traverse the mud without assistance—yet Cowsmic Moonbeams plowed through. 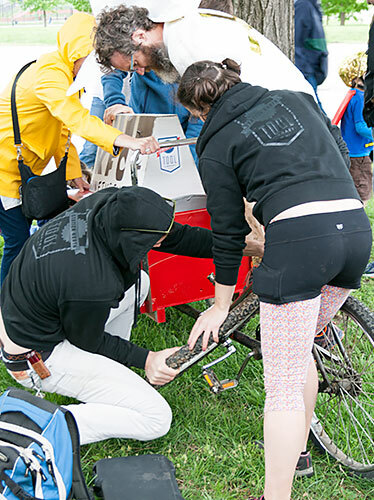 Anyone who’s used bicycle wheels on a kinetic sculpture knows about the dreaded taco—when a wheel bends like a taco. Bike wheels are aggressively optimized for minimal weight and become fragile in kinetic conditions: heavier loads and lateral forces. 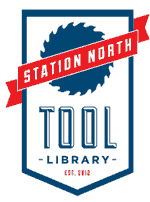 Fortunately for racers, Baltimore’s Station North Tool Library is on the scene ready for on-site repairs, even welding. This is the Cowsmic team shortly before the awards ceremony when they were declared Grand Champions. 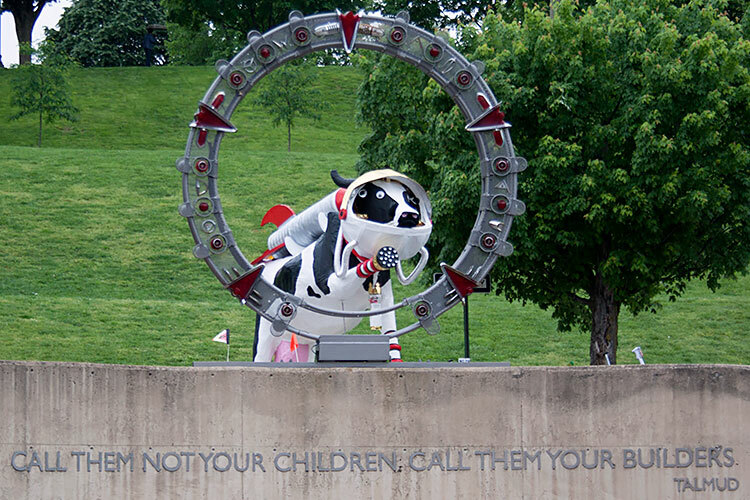 Cowsmic Moobeams approaching Stargate Baltimore.